Meet us around the world – this time at the Asia Brake conference and exhibition in Delhi, India, where representatives from Meneta China and Meneta India will welcome you at booth 32, ready to tell you everything about your possibilities with Meneta Group and showcase a product selection of shims and backing plates. 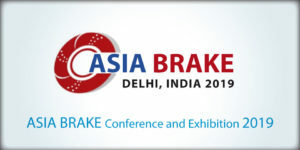 The Asia Brake conference and exhibition will take place February 24-26, 2019, and bring together companies, engineers, and academics, working in the field of brake technology. You can read more about the event here.